I’m so excited about how well these Dollar Tree storage containers have been with my kitchen cabinet organizing project. I’ve been organizing a little bit of everything and feeling a lot more in control of my space. It’s no longer a chore trying to find stuff in my deep freezer now that I’ve cleaned it and then organized it with dollar store containers. My next goal was a have a clutter free kitchen which I achieved in 5 steps. 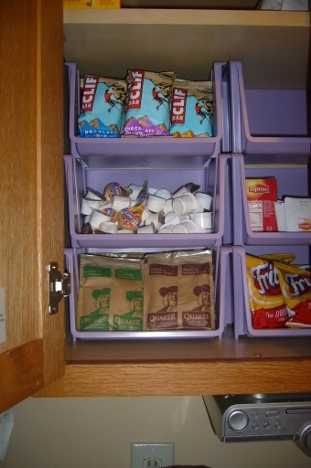 Part of the process was finding a way to store snacks without having things sitting out everywhere. When I saw these stackable containers at the dollar store I got a brilliant idea for my kitchen cabinet organizing project but I wasn’t sure it would work. Once I got home I tried stacking the containers in my kitchen cabinet but the cabinet height only allowed two to be stacked. I knew my cabinet shelf height could be adjusted, so I got to work detaching the clamps and readjusting the height to accommodate three stackable containers. Here are pictures of some stack-able storage containers which work perfectly for keeping snacks, breakfast and other small foods organized. My goal of kitchen cabinet organizing is a work in progress but I am very happy with the results of my dollar store purchase. The next project on my kitchen cabinet re-do will be finding some stackable containers to fit the area on the far right of the cabinet where the Coffee-mate is and replacing the cabinet noise dampers by re-purposing wine bottle corks. 10/21 #Dash4Cash & Prizes Winners + Enter to #Win 1 of 2 Kohl’s Gift Cards!! Make $5 Per Survey + Enter to #Win and iPad! I used the stackable containers under my kitchen sink. They hold cleaning items in categories such as sponges, scrubbing pads, dishwasher soap pods etc. makes everything much easier to find. A pressure curtain rod behind the stackers I hang bottles of spray cleaners. @Sidran, you’re welcome. So glad I was able to give you some ideas. This is brilliant! My pantry shelves are 15″ apart and I have a lot of wasted space in there because of items that can’t hold other items on top of them. I will head out to my local dollar store adn get some stackable bins. Thank you so much for sharing your idea! @You, Me & B, I agree about the wasted space. 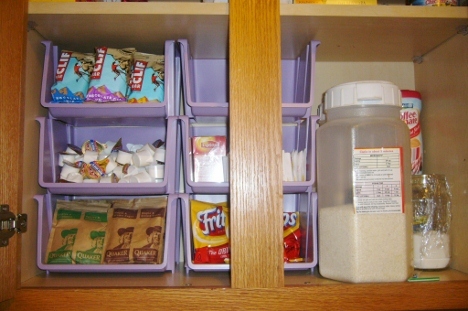 Unless you store tall items like cereal boxes, it’s unusable….unless you grab some stackable containers like these. I hope you are able to find them.